With improvements in survival from coronary artery disease (CAD) and an ageing population, refractory angina (RA) is becoming an increasingly common clinical problem facing clinicians in routine clinical practice. These patients experience chronic symptoms in the context of CAD, characterised by angina-type pain, which is uncontrolled despite optimal pharmacological, interventional and surgical therapy. Although mortality rates are no worse in this cohort, patients experience a significantly impaired quality of life with disproportionately high utilisation of healthcare services. It has been increasingly recognised that the needs of RA patients are multifactorial and best provided by specialist multi-disciplinary units. 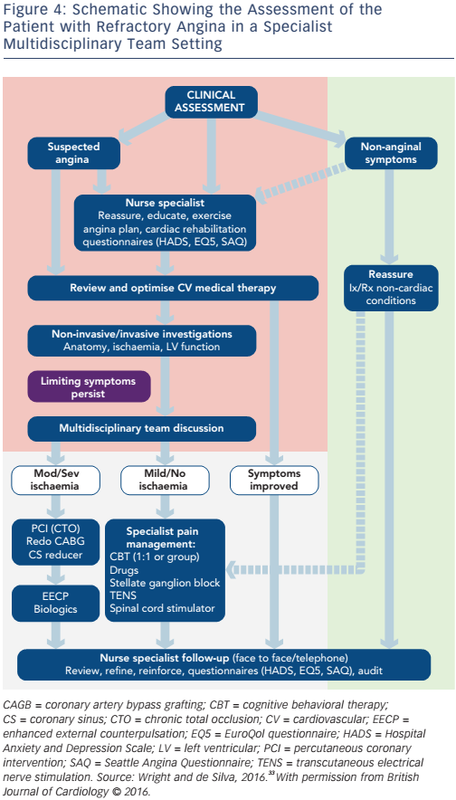 In this review, we consider the variety of therapies available to clinicians in the management of RA and discuss the promise of novel treatments. The authors would like to thank Dr Michael Rubens for assistance with labelling Figure 2c. In clinical practice, patients diagnosed with RA are a heterogeneous group; common among them, however, is that they remain significantly limited by persistent debilitating chest discomfort despite optimised conventional therapy. In many cases, functional imaging may not demonstrate myocardial ischaemia. It is important to recognise that irrespective of aetiology, patients with refractory chest discomfort often attribute their symptoms to be cardiac in origin and believe that they may herald a life-threatening cardiac event. This predisposes to a progressive decline in their mental wellbeing and increasing anxiety whereby pain begets pain. Consequently, patients can develop persistent symptoms and pessimistic health beliefs, translating to negative behaviours and an impaired quality of life. In this regard, a shift in our approach of RA to that of managing a ‘chronic chest pain syndrome’ may help us not only to better appreciate the multifactorial aetiologies that are in operation in any given patient but also encourage the use of a holistic approach to manage these patients more effectively. Patients with RA are a heterogeneous group that remain significantly limited by persistent debilitating chest discomfort despite optimal conventional therapy.1 This syndrome characteristically involves angina-type pain usually in the context of epicardial CAD with or without demonstrable ischaemia. Given the heterogeneity in patients complaining of chronic chest pain, appropriate stratification of patients with regard to their risk of RA helps to direct healthcare resources tailored to individual patients’ needs (see Figure 1). A convincing clinical history of angina, together with circumstantial evidence supporting a diagnosis, should raise clinical suspicion. The coronary anatomy in these patients is highly variable with many having had prior revascularisation (72.4 % by some estimates), and myocardial ischaemia is often difficult to detect using conventional stress imaging protocols.10 The absence of demonstrable myocardial ischaemia in the context of epicardial CAD is not uncommon in patients referred with suspected RA and should in itself not exclude the diagnosis. 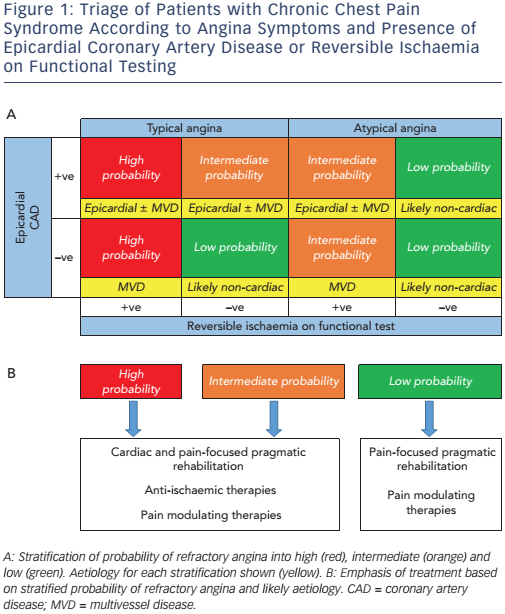 Interpretation of negative functional tests must therefore consider the caveat of 1) a false negative test result or 2) the degree of ischaemia lies below the detection threshold of the imaging modality employed. Furthermore, it is important to rule out a diagnosis of non-cardiac chest pain with bystander CAD. However, when a patient’s history is suggestive of angina in the absence of any other causative factor (anaemia, dyspepsia, musculoskeletal pain), the lack of demonstrable myocardial ischaemia should not absolutely preclude a diagnosis of RA. While these results are certainly encouraging, such analyses collate data from small clinical trials (phase I–II) and future work should focus on adequately powered, blinded trials with use of a sham control procedure for comparison.61 A number of unresolved issues remain; namely the optimal cell type, preparation, dose and method of delivery. In addition, the effects of cell therapy may be shortlived and recent data from Mann et al. suggest a need for repeated administrations to maintain efficacy.62,63 These issues must be resolved before cellular therapy can enter routine clinical practice. Furthermore, EECP has been associated with improvement in invasive haemodynamic measures of collateral function;65,66 flow-mediated dilatation of large peripheral arteries;67,68 endothelial function;69 and mediators of inflammation and vasoconstriction.70 A number of small studies have suggested potential benefit from EECP, the largest of which is the Multicenter Study of Enhanced External Counterpulsation (MUST-EECP) trial (n=139), which showed a reduction of self-reported angina episodes by ~25 % and time to development of 1 mm ST depression increased by ~15 %.71 Importantly, quality of life was improved. A meta-analysis subsequently suggested that EECP achieved an improvement in angina by at least one CCS class in 86 % of patients with stable angina pectoris, though this analysis was not restricted to those patients with RA.72 A more recent meta-analysis has reported similar results.73 However, while this technology has recently received a Class IIa, Level of Evidence B, recommendation in the European Society of Cardiology (ESC) guidelines for the management of stable CAD, a 2009 Health Technology Assessment report and Cochrane systematic review were unable to find clear evidence of clinical or cost-effectiveness.31,74,75 In addition, this therapy has a number of contraindications, notably arrhythmias, peripheral vascular disease, aortic aneurysm and aortic stenosis.5,71 Further adequately-powered, blinded, sham-controlled RCTs specifically in patients with RA are needed. Interestingly, pretreatment with ESMR therapy has been suggested to enhance the beneficial effects of BMCs delivered by intracoronary infusion in patients with ischaemic left ventricular dysfunction.83 The effects were small; however, ESMR + BMCs improved left ventricular ejection fraction by 3.2 % (95 % CI [2.0–4.4]) versus ESMR + placebo infusion 1.0 % (95 % CI [0.3–2.2]; p=0.020). Upregulation of signalling molecules (stromal cell-derived factor 1 [SDF-1] and vascular endothelial growth factor [VEGF]) by ESMR is thought to underlie this phenomenon of target tissue preconditioning that may aid progenitor cell engraftment.84 Further appropriately designed studies are needed to determine the mechanism and role of ESMR in RA. The perception of pain from visceral nociceptive stimuli is complex and the severity of symptoms is often disproportionate to the degree of ischaemia. Various approaches to modulate nociceptive signals are used in patients with RA (see Figure 3), of which, implantation of spinal cord stimulation (SCS) has received a Class IIb, Level of Evidence B, recommendation in recent ESC guidelines.6,31,85 This minimally invasive procedure involves the placement of multipolar electrodes into the epidural space to deliver an electrical current to the dorsal columns between C7 and T1.5,86,87 An implanted patientcontrolled pulse generator allows stimulation at the onset of angina, inducing paraesthesia at the location of anginal chest discomfort. Pragmatic rehabilitation is an important approach to promote patients to manage their own chest pain. Through learning cognitivebehavioural self-management techniques and challenging negative health beliefs, quality of life and psychological wellbeing can improve substantially. The Angina Plan is one such tool whereby patients’ understanding of angina can be evaluated and misconceptions corrected.94 It provides a structured approach to address maladaptive coping strategies in patients with angina and has been shown to significantly improve psychological wellbeing (anxiety and depression), symptoms (three episodes of angina fewer per week and reduced GTN use) and functional status (reduced physical limitation score and increased daily walking). Furthermore, from our experience, we have found that reassuring patients their symptoms are non-cardiac in origin has as important an impact as successful management of symptoms secondary to ischaemia. For patients with cardiac ischaemia, pragmatic rehabilitation consists of two main components. The first involves education to correct common misconceptions about angina and developing a basic understanding of the pain pathway. For example, the notion that stable angina in itself is not life-threatening and their pain not always cardiac in origin is emphasised. Underuse of GTN may occur due to perceptions that it may lose its effectiveness – thus such mistaken beliefs are corrected and patients encouraged to use their GTN more often. Furthermore, it is explained that the heart can ‘adapt’ to having angina through the process of ischaemic conditioning and collateralisation.95,96 The heightened perception of death is also challenged by discussing data from the OPTIMIST Registry (n=1,200) showing that 71.6 % of patients with RA have a 9-year life expectancy.10 Additionally, patient awareness is raised about how their mental state can significantly affect their perception of symptoms. The second component addresses important lifestyle adaptations that can significantly impact on patients’ symptoms (e.g. learning how to pace oneself, setting realistic goals and deconstructing tasks into manageable portions). Furthermore, behaviours to reduce cardiovascular risk (e.g. smoking cessation, weight loss and exercise) are strongly emphasised as is adherence to aggressive primary and secondary prevention. Almost by definition, the management of these ‘no option’ patients with RA is challenging. Their needs are best met via integrated care delivered by specialist multidisciplinary teams in dedicated specialist services (see Figure 4). Such a framework enables addressing the issues of this heterogeneous patient cohort in a bespoke way, and allows the full spectrum of clinical management including investigative and novel treatments for appropriately selected patients.33 Through such a combination approach involving selection from the spectrum of therapies mentioned above, management can be individually tailored to meet patients’ needs. Although such resources are scarce, the recognition of the importance of multidisciplinary teams in this unique subset of patients will hopefully encourage further provision of services. Whilst novel therapeutic approaches to managing these patients are welcome, evaluation of their efficacy through robust clinical data must be rigorously pursued. The development of clinical guidelines specific to RA should also be encouraged. Finally, further studies should investigate the effect of novel therapies on reducing healthcare utilisation and demonstrate cost-effectiveness in patients with RA. Mannheimer C, Camici P, Chester MR, et al. The problem of chronic refractory angina; report from the ESC Joint Study Group on the Treatment of Refractory Angina. Eur Heart J 2002;23:355–70. Jolicoeur EM, Granger CB, Henry TD, et al. Clinical and research issues regarding chronic advanced coronary artery disease: part I: Contemporary and emerging therapies. Am Heart J 2008;155:418–34. Williams B, Menon M, Satran D, et al. Patients with coronary artery disease not amenable to traditional revascularization: prevalence and 3-year mortality. Catheter Cardiovasc Interv 2010;75:886–91. Statistics Canada. Canadian Community Health Survey (CCHS). 2002. Available at: www23.statcan.gc.ca/imdb/p2SV. pl?Function=getSurvey&Id=3359 (Accessed 15 October 2016). McGillion M, Arthur HM, Cook A, et al. Management of patients with refractory angina: Canadian Cardiovascular Society/Canadian Pain Society joint guidelines. Can J Cardiol 2012;28(2 Suppl):S20-41. Bhatt AB, Stone PH. Current strategies for the prevention of angina in patients with stable coronary artery disease. Curr Opin Cardiol 2006;21 :492–502. Thadani U. Recurrent and refractory angina following revascularization procedures in patients with stable angina pectoris. Coron Artery Dis 2004;15:S1-4. British Cardiovascular Intervention Society Audit 2014. Available at: www.bcis.org.uk/pages/page_box_contents. asp?PageID=824 (Accessed 15 October 2016). Chow CM, Donovan L, Manuel D, et al. Canadian Cardiovascular Outcomes Research Team. Regional variation in self-reported heart disease prevalence in Canada. Can J Cardiol 2005;21 :1265–71. Henry TD, Satran D, Hodges JS, et al. Long-term survival in patients with refractory angina. Eur Heart J 2013;34:2683–8. IONA Study Group. Effect of nicorandil on coronary events in patients with stable angina: the Impact Of Nicorandil in Angina (IONA) randomised trial. Lancet 2002;359:1269–75. Fox K, Ford I, Steg PG, et al. BEAUTIFUL Investigators. Ivabradine for patients with stable coronary artery disease and left-ventricular systolic dysfunction (BEAUTIFUL): a randomised, double-blind, placebo-controlled trial. Lancet 2008;372:807–16. Tardif J-C, Ponikowski P, Kahan T, ASSOCIATE Study Investigators. Efficacy of the I(f) current inhibitor ivabradine in patients with chronic stable angina receiving beta-blocker therapy: a 4-month, randomized, placebo-controlled trial. Eur Heart J 2009;30:540–8. Fox K, Ford I, Steg PG, et al. Ivabradine in stable coronary artery disease without clinical heart failure. N Engl J Med 2014;371 :1091–9. Chaitman BR, Pepine CJ, Parker JO, et al. Effects of ranolazine with atenolol, amlodipine, or diltiazem on exercise tolerance and angina frequency in patients with severe chronic angina: a randomized controlled trial. JAMA 2004;291 :309–16. Wilson SR, Scirica BM, Braunwald E, et al. Efficacy of ranolazine in patients with chronic angina observations from the randomized, double-blind, placebo-controlled MERLINTIMI (Metabolic Efficiency With Ranolazine for Less Ischemia in Non-ST-Segment Elevation Acute Coronary Syndromes) 36 Trial. J Am Coll Cardiol 2009;53:1510–6. Kosiborod M, Arnold SV, Spertus JA, et al. Evaluation of ranolazine in patients with type 2 diabetes mellitus and chronic stable angina: results from the TERISA randomized clinical trial (Type 2 Diabetes Evaluation of Ranolazine in Subjects With Chronic Stable Angina). J Am Coll Cardiol 2013;61 :2038–45. Ling H, Packard KA, Burns TL, Hilleman DE. Impact of ranolazine on clinical outcomes and healthcare resource utilization in patients with refractory angina pectoris. 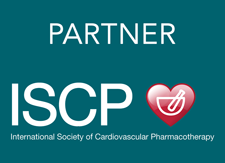 Am J Cardiovasc Drugs 2013;13:407–12. Banon D, Filion KB, Budlovsky T, et al. The usefulness of ranolazine for the treatment of refractory chronic stable angina pectoris as determined from a systematic review of randomized controlled trials. Am J Cardiol 2014;113:1075–82. Bennett NM, Iyer V, Arndt TL, et al. Ranolazine refractory angina registry: 1-year results. Crit Pathw Cardiol 2014;13:96–8. Ciapponi A, Pizarro R, Harrison J. Trimetazidine for stable angina. Cochrane Database Syst Rev 2005;(4):CD003614. Grabczewska Z, Białoszyn´ski T, Szyman´ ski P, et al. The effect of trimetazidine added to maximal anti-ischemic therapy in patients with advanced coronary artery disease. Cardiol J 2008;15:344–50. Cole PL, Beamer AD, McGowan N, et al. Efficacy and safety of perhexiline maleate in refractory angina. A double-blind placebo-controlled clinical trial of a novel antianginal agent. Circulation 1990;81 :1260–70. Phan TT, Shivu GN, Choudhury A, et al. Multi-centre experience on the use of perhexiline in chronic heart failure and refractory angina: old drug, new hope. Eur J Heart Fail 2009;11 :881–6. Messin R, Boxho G, De Smedt J, Buntinx IM. Acute and chronic effect of molsidomine extended release on exercise capacity in patients with stable angina, a double-blind cross-over clinical trial versus placebo. J Cardiovasc Pharmacol 1995;25:558–63. Messin R, Fenyvesi T, Carreer-Bruhwyler F, et al. A pilot double-blind randomized placebo-controlled study of molsidomine 16 mg once-a-day in patients suffering from stable angina pectoris: correlation between efficacy and over time plasma concentrations. Eur J Clin Pharmacol 2003;59: 227–32. Messin R, Opolski G, Fenyvesi T, et al. Efficacy and safety of molsidomine once-a-day in patients with stable angina pectoris. Int J Cardiol 2005;98:79–89. Vicari RM, Chaitman B, Keefe D, et al. Efficacy and safety of fasudil in patients with stable angina: a doubleblind, placebo-controlled, phase 2 trial. J Am Coll Cardiol 2005;46:1803–11. National Institute for Health and Care Excellence. Clinical Guideline [CG126]. 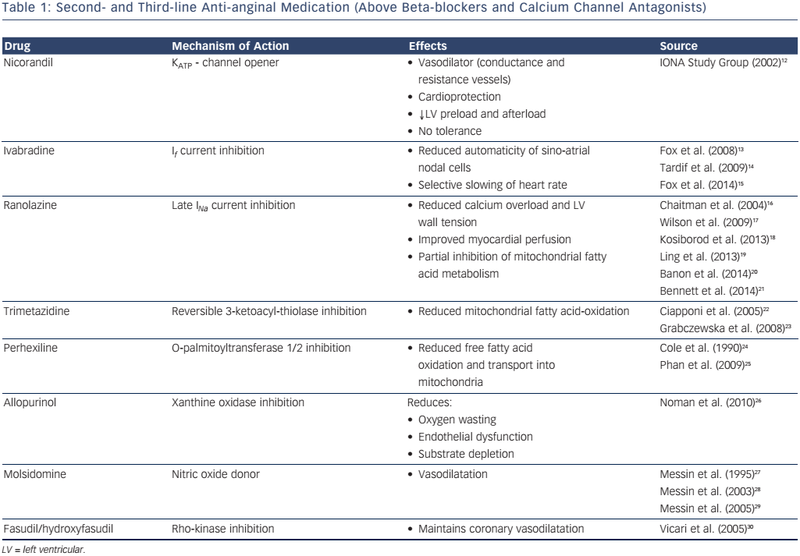 Stable angina: management. 2016. Available at: www.nice.org.uk/guidance/Cg126 (Accessed 15 October 2016). Wright C, de Silva R. Management of refractory angina: the importance of winning over both hearts and minds. Br J Cardiol 2016;23:45–6. Ido A, Hasebe N, Matsuhashi H, Kikuchi K. Coronary sinus occlusion enhances coronary collateral flow and reduces subendocardial ischemia. Am J Physiol Heart Circ Physiol 2001;280:H1361–7. Beck CS, Leighninger DS. Scientific basis for the surgical treatment of coronary artery disease. J Am Med Assoc 1955;159:1264–71. Beck CS, Leighninger DS. Operations for coronary artery disease. J Am Med Assoc 1954;156:1226–33. Banai S, Ben Muvhar S, Parikh KH, et al. Coronary sinus reducer stent for the treatment of chronic refractory angina pectoris: a prospective, open-label, multicenter, safety feasibility first-in-man study. J Am Coll Cardiol 2007;49:1783–9. Camici PG, Crea F. Coronary microvascular dysfunction. N Engl J Med 2007;356:830–40. Verheye S, Jolicœur EM, Behan MW, et al. 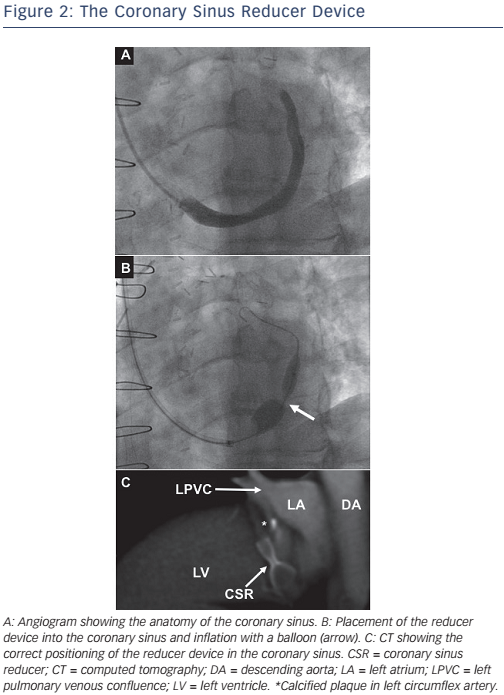 Efficacy of a device to narrow the coronary sinus in refractory angina. N Engl J Med 2015;372:519–27. Banai S, Schwartz M, Sievert H, et al. Long-term follow-up to evaluate the safety of the Neovasc Reducer a devicebased therapy for chronic refractory angina. J Am Coll Cardiol 2010;55:A98.E927. Ormerod JOM, Gamble JHP, Betts TR. A device to narrow the coronary sinus for angina. N Engl J Med 2015;372:1966. Neovasc Inc. REDUCER-I: An Observational Study of the Neovasc ReducerTM System. ClinicalTrials.gov [Internet]. Bethesda (MD): National Library of Medicine (US). 2000). Available at: www.clinicaltrials.gov/show/NCT02710435 (NLM Identifier NCT02710435) (Accessed 15 October 2016). Tel-Aviv Sourasky Medical Center. Use of the Neovasc Coronary Sinus Reducer System for the Treatment of Refractory Angina Pectoris in Patients With Ngina Class 3-4 Who Are Not Candidates for Revascularization (Reducer). ClinicalTrials.gov [Internet]. Bethesda (MD): National Library of Medicine (US). 2000. Available at: www.clinicaltrials.gov/ show/NCT01566175 (NLM Identifier NCT01566175) (Accessed 15 October 2016). van Ramshorst J, Bax JJ, Beeres SLMA, et al. Intramyocardial bone marrow cell injection for chronic myocardial ischemia: a randomized controlled trial. JAMA 2009;301 :1997–2004. van Ramshorst J, Rodrigo SF, Beeres SL, et al. Long term effects of intramyocardial bone marrow cell injection on anginal symptoms and quality of life in patients with chronic myocardial ischemia. Int J Cardiol 2013;168:3031–2. Tse HF, Thambar S, Kwong YL, et al. Prospective randomized trial of direct endomyocardial implantation of bone marrow cells for treatment of severe coronary artery diseases (PROTECT-CAD trial). Eur Heart J 2007;28:2998–3005. Losordo DW, Schatz RA, White CJ, et al. Intramyocardial transplantation of autologous CD34+ stem cells for intractable angina: a phase I/IIa double-blind, randomized controlled trial. Circulation 2007;115:3165–72. Losordo DW, Henry TD, Davidson C, et al. Intramyocardial, autologous CD34+ cell therapy for refractory angina. Circ Res 2011;109:428–36. Wang S, Cui J, Peng W, Lu M. Intracoronary autologous CD34+ stem cell therapy for intractable angina. Cardiology 2010;117:140–7. Povsic TJ, Henry TD, Traverse JH, et al. The RENEW Trial: Efficacy and Safety of Intramyocardial Autologous CD34(+) Cell Administration in Patients With Refractory Angina. JACC Cardiovasc Interv 2016;9:1576–85. Henry TD, Schaer GL, Traverse JH, et al. Autologous CD34(+) Cell Therapy for Refractory Angina: 2-Year Outcomes From the ACT34-CMI Study. Cell Transplant 2016;25:1701–11. Jimenez-Quevedo P, Gonzalez-Ferrer JJ, Sabate M, et al. Selected CD133+ progenitor cells to promote angiogenesis in patients with refractory angina: final results of the PROGENITOR randomized trial. Circ Res 2014;115:950–60. Tomita S, Li RK, Weisel RD, et al. Autologous Transplantation of Bone Marrow Cells Improves Damaged Heart Function. Circulation 1999;100(19 Suppl):II247–256. Kinnaird T, Stabile E, Burnett MS, et al. Marrow-derived stromal cells express genes encoding a broad spectrum of arteriogenic cytokines and promote in vitro and in vivo arteriogenesis through paracrine mechanisms. Circ Res 2004;94:678–85. Kinnaird T, Stabile E, Burnett MS, et al. Local delivery of marrow-derived stromal cells augments collateral perfusion through paracrine mechanisms. Circulation 2004;109:1543–9. Li N, Yang YJ, Zhang Q, et al. Stem cell therapy is a promising tool for refractory angina: a meta-analysis of randomized controlled trials. Can J Cardiol 2013;29:908–14. Florea V, Balkan W, Schulman IH, Hare JM. Cell Therapy Augments Myocardial Perfusion and Improves Quality of Life in Patients With Refractory Angina. Circ Res 2016;118:911–5. Mann I, Rodrigo SF, van Ramshorst J, et al. Repeated Intramyocardial Bone Marrow Cell Injection in Previously Responding Patients With Refractory Angina Again Improves Myocardial Perfusion, Anginal Complaints, and Quality of Life. Circ Cardiovasc Interv 2015;8:e002740. Henry TD, Povsic TJ. Repeat Cell Therapy for Refractory Angina: Déjà vu All Over Again? Circ Cardiovasc Interv 2015;8:e003049. Manchanda A, Soran O. Enhanced external counterpulsation and future directions: step beyond medical management for patients with angina and heart failure. J Am Coll Cardiol 2007;50:1523–31. Buschmann EE, Utz W, Pagonas N, et al. Improvement of fractional flow reserve and collateral flow by treatment with external counterpulsation (Art.Net.-2 Trial). Eur J Clin Invest 2009;39:866–75. Gloekler S, Meier P, de Marchi SF, et al. Coronary collateral growth by external counterpulsation: a randomised controlled trial. Heart 2010;96:202–7. Levenson J, Simon A, Megnien JL, et al. Effects of enhanced external counterpulsation on carotid circulation in patients with coronary artery disease. Cardiology 2007;108:104–10. Levenson J, Pernollet MG, Iliou MC, et al. Cyclic GMP release by acute enhanced external counterpulsation. Am J Hypertens 2006;19:867–72. Casey DP, Conti CR, Nichols WW, et al. Effect of enhanced external counterpulsation on inflammatory cytokines and adhesion molecules in patients with angina pectoris and angiographic coronary artery disease. Am J Cardiol 2008;101 :300–2. Arora RR, Chou TM, Jain D, et al. The multicenter study of enhanced external counterpulsation (MUST-EECP): effect of EECP on exercise-induced myocardial ischemia and anginal episodes. J Am Coll Cardiol 1999;33:1833–40. Shah SA, Shapiro RJ, Mehta R, Snyder JA. Impact of enhanced external counterpulsation on Canadian Cardiovascular Society angina class in patients with chronic stable angina: a meta-analysis. Pharmacotherapy 2010;30:639–45. Zhang C, Liu X, Wang X, et al. Efficacy of Enhanced External Counterpulsation in Patients With Chronic Refractory Angina on Canadian Cardiovascular Society (CCS) Angina Class: An Updated Meta-Analysis. Medicine (Baltimore) 2015;94:e2002. McKenna C, McDaid C, Suekarran S, et al. 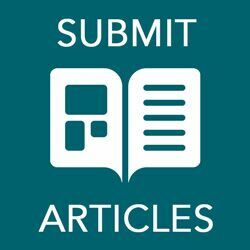 Enhanced external counterpulsation for the treatment of stable angina and heart failure: a systematic review and economic analysis. Health Technol Assess 2009;13:iii–iv, ix–xi, 1-90. Amin F, Al Hajeri A, Civelek B, et al. Enhanced external counterpulsation for chronic angina pectoris. Cochrane Database Syst Rev 2010;(2):CD007219. Alunni G, Marra S, Meynet I, et al. The beneficial effect of extracorporeal shockwave myocardial revascularization in patients with refractory angina. Cardiovasc Revasc Med 2015;16:6–11. Prasad M, Wan Ahmad WA, Sukmawan R, et al. Extracorporeal shockwave myocardial therapy is efficacious in improving symptoms in patients with refractory angina pectoris–a multicenter study. Coron Artery Dis 2015;26:194– 200. Song J, Qi M, Kaul S, Price RJ. Stimulation of arteriogenesis in skeletal muscle by microbubble destruction with ultrasound. Circulation 2002;106:1550–5. Nishida T, Shimokawa H, Oi K, et al. Extracorporeal cardiac shock wave therapy markedly ameliorates ischemia-induced myocardial dysfunction in pigs in vivo. Circulation 2004;110:3055–61. Fukumoto Y, Ito A, Uwatoku T, et al. Extracorporeal cardiac shock wave therapy ameliorates myocardial ischemia in patients with severe coronary artery disease. Coron Artery Dis 2006;17:63–70. Yang P, Guo T, Wang W, et al. Randomized and double-blind controlled clinical trial of extracorporeal cardiac shock wave therapy for coronary heart disease. Heart Vessels 2013;28:284–91. Slavich M, Ancona F, Margonato A. Extracorporeal shockwave myocardial revascularization therapy in refractory angina patients. Int J Cardiol 2015;194:93. Assmus B, Walter DH, Seeger FH, et al. Effect of shock wave-facilitated intracoronary cell therapy on LVEF in patients with chronic heart failure: the CELLWAVE randomized clinical trial. JAMA 2013;309:1622–31. Aicher A, Heeschen C, Sasaki K, et al. Low-energy shock wave for enhancing recruitment of endothelial progenitor cells: a new modality to increase efficacy of cell therapy in chronic hind limb ischemia. Circulation 2006;114:2823–30. Rosen SD. From heart to brain: the genesis and processing of cardiac pain. Can J Cardiol 2012;28(2 Suppl):S7–19. TenVaarwerk I, Jessurun G, DeJongste M, et al. Clinical outcome of patients treated with spinal cord stimulation for therapeutically refractory angina pectoris. The Working Group on Neurocardiology. Heart 1999;82:82–8. Ekre O, Eliasson T, Norrsell H, et al. Long-term effects of spinal cord stimulation and coronary artery bypass grafting on quality of life and survival in the ESBY study. Eur Heart J 2002;23:1938–45. de Jongste MJ, Haaksma J, Hautvast RW, et al. Effects of spinal cord stimulation on myocardial ischaemia during daily life in patients with severe coronary artery disease. A prospective ambulatory electrocardiographic study. Br Heart J 1994;71 :413–8. Hautvast RW, Blanksma PK, DeJongste MJ, et al. Effect of spinal cord stimulation on myocardial blood flow assessed by positron emission tomography in patients with refractory angina pectoris. Am J Cardiol 1996;77:462–7. Prager JP. What does the mechanism of spinal cord stimulation tell us about complex regional pain syndrome? Pain Med 2010;11 :1278–83. Taylor RS, De Vries J, Buchser E, Dejongste MJ. Spinal cord stimulation in the treatment of refractory angina: systematic review and meta-analysis of randomised controlled trials. BMC Cardiovasc Disord 2009;9:13. Andréll P, Yu W, Gersbach P, et al. Long-term effects of spinal cord stimulation on angina symptoms and quality of life in patients with refractory angina pectoris--results from the European Angina Registry Link Study (EARL). Heart 2010;96:1132–6. Eldabe S, Thomson S, Duarte R, et al. The Effectiveness and Cost-Effectiveness of Spinal Cord Stimulation for Refractory Angina (RASCAL Study): A Pilot Randomized Controlled Trial. 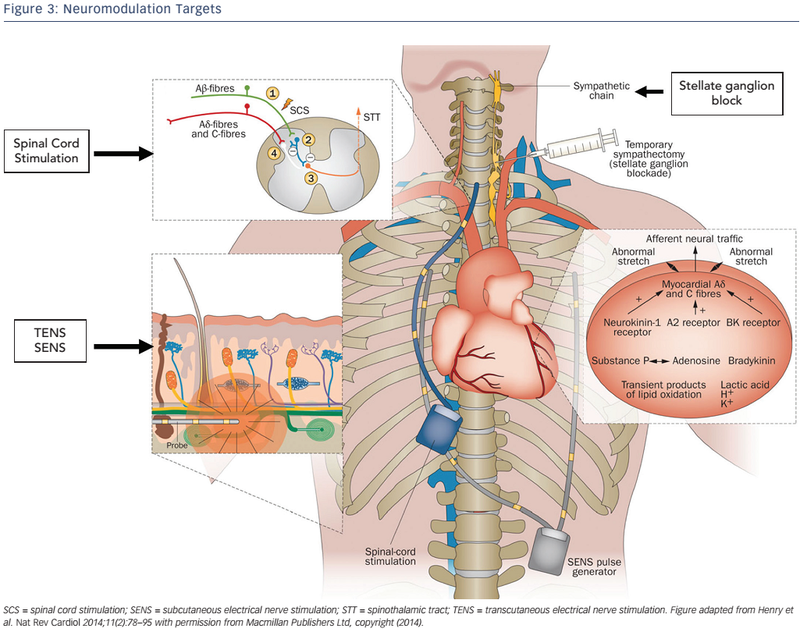 Neuromodulation 2016;19:60–70. Kloner RA, Shook T, Przyklenk K, et al. Previous angina alters in-hospital outcome in TIMI 4. A clinical correlate to preconditioning? Circulation 1995;91 :37–45. Koerselman J, van der Graaf Y, de Jaegere PPT, Grobbee DE. Coronary collaterals: an important and underexposed aspect of coronary artery disease. Circulation 2003;107:2507–11. Khan M, Thappar S, Taylor S, Sainsbury P. The impact of a short psychological intervention on quality of life and angina control in patients with chronic refractory angina. Eur Heart J 2013;34:P2265. Moore RK, Groves D, Bateson S, et al. Health related quality of life of patients with refractory angina before and one year after enrolment onto a refractory angina program. Eur J Pain 2005;9:305–10. Neubeck L, Lowres N, Benjamin EJ, et al. The mobile revolution--using smartphone apps to prevent cardiovascular disease. Nat Rev Cardiol 2015;12:350–60. Cheng K, Ingram N, Keenan J, Choudhury RP. Evidence of poor adherence to secondary prevention after acute coronary syndromes: possible remedies through the application of new technologies. Open Heart 2015;2:e000166. Patel PA, Khan M, Thapar S, et al. The short- and long-term impact of psychotherapy in patients with chronic, refractory angina. Br J Cardiol 2016;23:57–60. Tinson D, Swartzman S, Lang K, et al. Clinical and psychological outcomes of an angina management programme. Br J Cardiol 2016;23:61–4.